Ermita de la Virgen del Puerto, a shrine to Our Lady of the Harbour. This delightful Ermita is hidden away between the River Manzanares and the Campo del Moro gardens. Ermitas or hermitages are common throughout Spain. They are a shrine or chapel, generally containing an image or statue of a "Virgen" or of a saint. Most villages and areas of towns and cities have images of their own patron saint and/or Virgen, which is housed in an Ermita and often paraded through the streets on a dais during religious festivals, and at Easter. This particular image of the Virgen originated in Lisbon, and was taken from there to the city of Palencia for safety when the Moors invaded, eventually arriving in Madrid much later. The Ermita de la Virgen del Puerto, or Our Lady of the Harbour, is a reconstruction of the original, built between 1716 and 1718 by Pedro de Ribera for the Marquis of Vadillo, but destroyed during the Civil War. Both men are buried in the church. Ribera designed the Marquis' tomb, and was also responsible for building the Puente de Toledo. 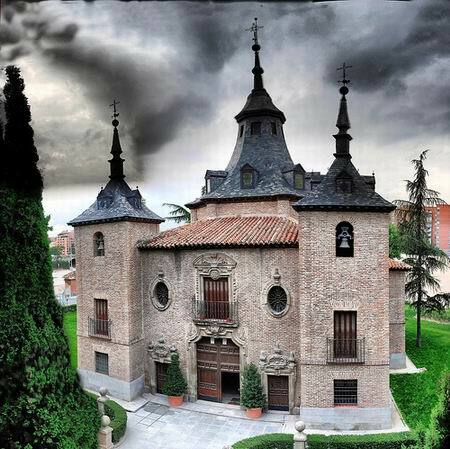 Extensions were added in 1780 to this original building, under the direction of the architect Juan Durán. After the Civil War damage, reconstruction work was commissioned, and completed in 1945 under the direction of the architect Carlos Mendoza. The current church has four chapels and takes the form of a Greek cross with two semi-circular chapels at the sides, a concave tower and spire in the centre and two similar towers either side of the entrance. The façade is decorated above the windows and large wooden entrance door and inside are works of art by Zacarías González Velázquez, who also painted the frescos on the inside of the cupola. The building was declared a National Monument in 1945, the year its reconstruction was completed. The Ermita was originally constructed in this spot, close to the River Manzanares, so that the women washing there would have a place to worship within easy distance of their work. The Virgen has also been known locally as La Melonera because melon-sellers plied their trade there on her Feast Day. The festival of La Melonera still takes place in September each year, and a number of daytime and evening events are held, including music and dancing. Entrance to the monument is free, but it is only open during Mass. The nearest metro station is Príncipe Pío, and the church can be found in the Paseo de la Virgen del Puerto where it meets the Calle de Segovia.